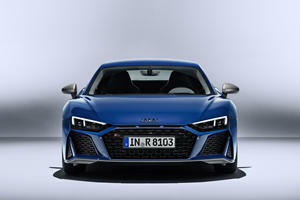 With three versions available, the Audi R8 Coupe is the supercar for the people. There’s a “low power” 540 hp coupe, a 610 hp coupe and a 540 hp convertible that’s only a little heavier overall but otherwise identical. The base R8 starts at $164,900, the F10 Plus lists at $194,400 and the convertible falls in the middle at $177,100. All models feature Audi’s Quattro all-wheel drive system, a 7-speed dual clutch transmission and all the best bits from the RS stable for the interior. The Audi R8 Coupe is quite possibly the best non-supercar supercar that you can buy today. 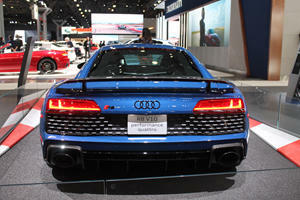 There are many levels to the fast cars from Audi, but the top dog is undoubtedly the R8 Coupe. It’s essentially a supercar that wears four rings; it’s the most aggressive looking Audi, has the biggest engine and is the fastest. Before the Audi R8 V10 Plus was released, the S8 was the most powerful Audi at 605 hp, but that’s been relegated to second spot due to 610 hp in the Plus model. The non-Plus version is rated at 540 hp, which still makes for some very impressive performance. Besides the high power rating, every other part of the car screams race car for the road. Inside the Audi R8 Coupe things are much the same as what you find in the Audi TT. The race seats are fully adjustable but the best position on the driver’s side is when they’re low so that the driver’s door, steering wheel and center console wrap around like a leather and carbon fiber cocoon. Everything is focused on the driver, so there’s no infotainment screen in the center of the dashboard but instead three dials for the climate control. Below that there’s a recess that stretches under the dash where there’s a compartment housing USB points. Infotainment, and everything else like the instrument cluster and navigation are displayed in front of the driver, behind the flat-bottom multifunction steering wheel, on a 12.3-inch digital display. Things are controlled via the steering wheel or the dial on the center divide below the shifter. Storage is limited to a small trunk and a few pockets here and there, so if a road trip is on the cards, owners will have to ship their goods ahead of time, or just buy new there. The Audi R8 Coupe is all about the drive, the very fast drive. The steering is sharp and precise and it firms up as speed increases to keep things safe, and combined with the Audi magnetic ride system, the dampers are continually adjusted to make sure the chassis is as planted as possible. Drive modes are Dynamic, Comfort, Individual and Auto accessed via Audi Drive select and this also controls how the all-wheel drive system behaves. The Quattro all-wheel drive system in the R8 works a little different, it’s biased to the rear wheels but can transfer 100% of the torque to the front when the road conditions dictate. The 7-speed S-tronic transmission is lightning quick when needed and is great when left to it’s own devices but is equally as good when being shifted via the steering-mounted paddles. 14.4-inch discs with 4-pot Brembo calipers means the R8 can stop on the proverbial dime. The combination of everything is supercar performance in every respect in a car that’s equally at home on the suburban roads and highways as it is on the racetrack. 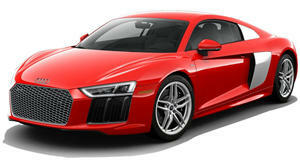 The Audi R8 Coupe is available in two trims, both making use of the 5.2-liter Audi V10 powerplant. In the normal R8, the normally aspirated V10 is rated at 540 hp with 398 lb-ft and that’s enough to get the car to 60 mph in 3.5-seconds and to a top speed of an electronically limited 199 mph. In the V10 Plus model that power has increased to 610 hp from the same 5.2-liter engine, with torque up at 413 lb-ft. 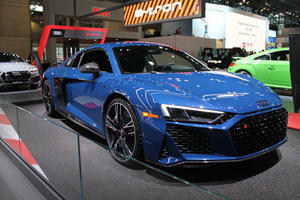 In this spec the R8 can hit 60 mph in just 3.2-seconds with top speed limited to a higher 205 mph. Both versions use the same dual clutch, 7-speed automatic transmission and Quattro all-wheel drive. With a car this fast, safety is a concern and so Audi has standard features like front, side, head and knee airbags, ABS & EBD and electronic stability control. Equipment is good with standard MMI navigation with Google Earth, a Wi-Fi hotspot and traffic information accessed via the virtual cockpit headed up with a fully digital 12.3-inch instrument display. It’s also where the rear view camera displays its path. One option that’s worthwhile is the 550-watt Bang & Olufsen sound system, which in the small cabin is like being live at a concert. There are countless ways to customize the leather and the trim, but the full carbon fiber package is what you want, that we all want. What Audi has managed to do with the R8 is amazing. They have created an easily available sports car that anyone with the right budget has access to, and they gave it supercar performance but have managed to stay away from actually calling it a supercar. In the V10 Plus guise it’s the most powerful Audi created to date, which also means it’s the fastest one too. Striking looks, an amazing motor and transmission and a 0-60 mph of just 3.2-seconds make this the most desirable Audi ever. This rare special edition model makes an appearance at the 2019 NY Auto Show.